If It's Too Loud...: Potty Mouth - "22"
Los Angeles's Potty Mouth have this 90's infused blend of alternative pop rock that we can help but get into. Their new single, "22," is an absolute blast. It's a fun pop punk song, leaning very heavily onto the pop side of things. It has the catchiness and the crunchy guitars of early Letters to Cleo, but the punk attitude of The Donnas, especially with singer Abby Weems's vocal delivery. A warning to all of us old fogies out there: The song is about being nervous about turning twenty two. Not thirty. Not even twenty five. Twenty two. Just let that sink in for a bit... Regardless, if you can get past that, there is no way you won't love the song. You can listen to "22" below. 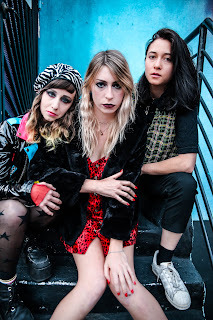 SNAFU, the new album from Potty Mouth, will be out March 1 on Get Better Records. Pre-orders of the album on blue vinyl will come with a comic book titled Potty Mouth: Situation Normal All Fucked Up that was written and illustrated by Abby Weems. You can pre-order the album here. For more on Potty Mouth, check out their website.